Genoa, Italy. February 29, 2012. A day in the history of the US Soccer National Team. A perfect game by the Americans that gave us their first ever win versus the Italians in 11 all-time meetings. No Donovan, no problem. Not when we have Dempsey. So Clint did it again. A sublime pass by Altidore as the AZ attacker used his body to keep possession found a well-positioned Dempsey. The Fulham attacker dribbled slightly and released a low, well-placed shot to the right of Buffon. Goal. Dempsey had a scintillating performance not just in the offense as he found the spaces and complemented Altidore, but also in the defensive end of play. The Furman University product stayed close to Pirlo for good stretches of the match and was effective in slowing down the talented Italian. This national team had more than just Donovan missing. Also out were Onyewu, Torres and Timmy Chandler. But in stepped Fabian Johnson and Jonathan Spector at left back, Brek Shea on the left wing and Terrence Boyd as an option at forward. The left side struggled at times but was still able to deconstruct the Italian attack from the right flank. This game was an affirmation that the Klinsmann system may indeed be working after all. That's 4 wins in a row and 3 away from home, two versus European sides with full squads and one away to a Concacaf foe. His positioning of Altidore with Dempsey right behind him emulates the way "Deuce" is utilized at Fulham. As forward/midfielder, Dempsey is the best option at that position. The left back spot is up for grabs, as always, although Chandler/Spector/Johnson seem to have a good grip on it for now. Any one of those players can hold their own in that spot even if it isn't their natural position. Until a true left back option emerges, a defensive "committee," of sorts, will do. The defensive midfield also performed quite well today. Maurice Edu and Michael Bradley were both excellent in their positioning and awareness. Bradley's experience with the Italian game (as a member of Chievo Verona) has made him grow in important strides as a soccer player. He had style today, no doubt about that. In the past, I have written about Americanizing the Premier League, American Scandinavia and the American Glasgow Rangers. But there is another important piece to Americans playing abroad: Germany. Indeed, the Bundesliga and 2.Bundesliga has become a target for MLS and college players. Donovan tried his luck with Bayern Leverkusen and Bayern Munich. Steve Cherundolo has been at Hanover all of his professional career. Add to this list Kasey Keller, Michael Bradley, Heath Pearce, DaMarcus Beasley, Jovan Kirovski, and the pattern gains more clarity. The Bundesliga is another American base. Germany is a tough place to play in. The style is physically demanding and the winters are equally difficult to endure. Michael Bradley soared to new heights with Moenchengladbach but lost his place after coaching changes. Landon Donovan never quite convinced with either team he played for. Beasley scarcely saw the pitch, and neither did Pearce. But there is another reason why there is a new "American Bundesliga." 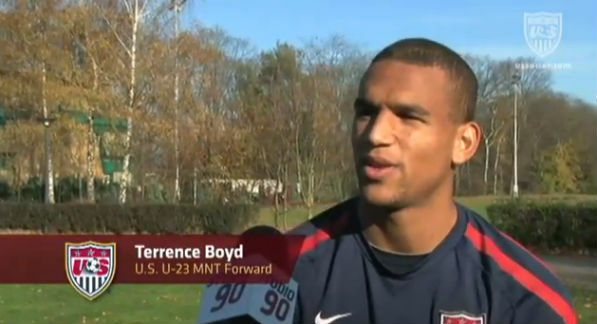 It is the German connection that the US national team has been able to identify and utilize: Jermaine Jones, Danny Williams, Fabian Johnson, Timmy Chandler, Terrence Boyd. All of these players share the same background: a German mother and an American serviceman. These gentlemen stayed and grew up in Germany and were exposed to soccer from an early age. Their automatic FIFA double nationality means they can choose either country. In their case, there is a long waiting list to be a Germany national team player. This line is shorter for Team USA, especially with Juergen Klinsmann at the helm. The German connection is quickly Americanizing the Bundesliga in a grassroots manner, from the bottom up. No longer is it just a college or a talented MLS player that gets a shot at playing in this legendary league. Now, the league raises American player as their own through rigorous training, match experience and media coverage. These individuals grow up through each of these team's academies. And thus we reach Terrence Boyd, a striker yet to score for Borussia Dortmund but one that his coach has been prepping for the big time. Who is to say that he can't become a breakout star and finally play alongside Altidore? Only time will tell how this latest Americanization of European soccer heads to. For Germany, the military connection adds a different route, but considering that Ricardo Clark and Edson Buddle both found successful stints in 2.Bundesliga it can be surmised that Americans are ready for this league. They already own it at every position on the pitch, from the academy to the transfer. So hold on, Bundesliga, the American soccer revolution has just begun in your league. Wow. What a turn of events for the English national team. 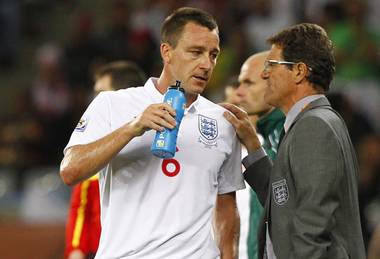 News broke today that Fabio Capello, manager of England, has resigned from his post following the FA's decision to strip John Terry of his captaincy due to the racial-comment controversy. England's team is again in turmoil ahead of major competition: Euro 2012 and the London Olympics. Perhaps the most important fact in all of this is that Terry has done it again for England. Yes, his problems with Wayne Bridge prior to World Cup 2010 caused internal strife in the team that took attention away from the pitch and, ultimately, distracted players from what was at stake on the soccer pitch. Would England have been better in group play? If they had won the group they would have evaded the talented German team and, perhaps, could have gotten past Ghana and Uruguay. It also comes down to Capello's philosophy on and off the pitch. His side was never as dominant as expected from such an experienced and talented coach. Maybe the international scene just didn't suit him but maybe it was his unwillingness to understand and react to non-soccer happenings that pushed him to end his time as England manager. Terry's play has been in decline for some time now, even to the point of relegating him to the Chelsea bench. Having him next to Rio Ferdinand (brother of Anton Ferdinand in the racism controversy) just isn't feasible. This is especially true since Ferdinand continues to be a relevant player in the Premier League and internationally. No, Mr. Capello, Terry just doesn't fit in with the English defense anymore. Worse still would be to keep him as captain. How does England address this problem? Considering that major international tournaments are so close to this event, important, calculated decisions remain to be made. The track record for most teams around the world indicates that the outcome isn't favorable for England's team. If, however, Harry Redknapp is able to rally his players and country in an unprecedented manner, then there is a chance things may favor the team. This is possible: Aguirre made a difference with Mexico in the previous World Cup cycle, although he had more time than is available for England's next manager prior to the international tournament. However, at that point, Mexico was seeing his qualification in danger. Another example is Luis Fernando Suarez for Ecuador during the 2006 qualifiers. When Hernan Dario Gomez left unexpectedly, Suarez was able to turn the turmoil into the best qualification process the team had ever seen. So, plenty to digest for English football fans. Difficult times lie ahead, but life after Capello may offer better results on the pitch.